The Festival offers many facets of Japanese music culture. 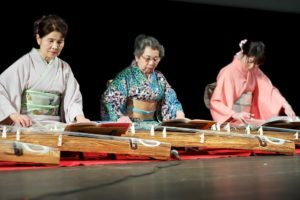 From the Japanese drum (Taiko), harp (Koto), and flute (Shakuhachi), to the three-stringed instrument (Shamisen/Sangen), you can experience and feel the passion of each of the talented artists as they perform for the audience. The easily recognizable heartbeat of any Japanese festival, the sacred taiko drum is said to have been introduced to Japan from China in the fifth and sixth centuries. 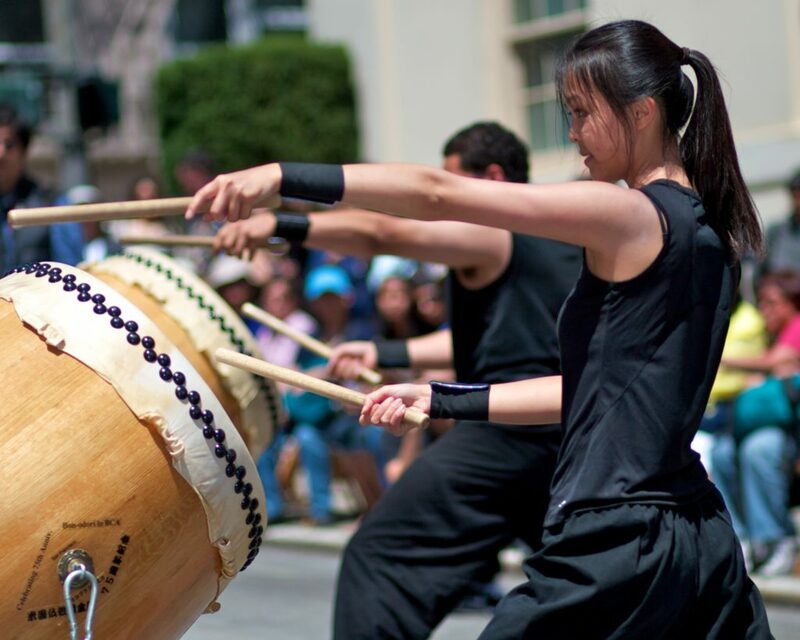 The powerful drumming was historically used in warfare, in religious ceremonies, in Noh and Kabuki theater, and is now popularly used in celebrations by thousands of taiko groups worldwide. Each year, a variety of dynamic groups play throughout the Cherry Blossom Festival and come together for a special collective performance of their own. 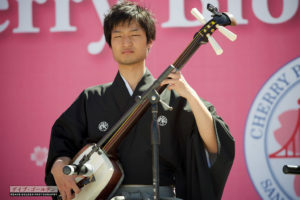 The Shamisen or Sangen is a three-stringed traditional Japanese musical instrument derived from the Chinese instrument, Sanxian. The players holds a bachi to pluck the strings. The Shamisen varies in shape, depending on the genre. Ths square body is covered with skin in the manner of a banjo and amplifies the sound of the strings. The Shamisen became a popular instrument in the entertainment districts of Japanese cities during the Edo period (17th century). The Japanese flute, Shakuhachi, was originally introduced from China to Japan in the 8th century and underwent a resurgence in the early Edo Period. The shakuhachi is traditionally made of bamboo, but versions now exist in ABS plastic and hardwoods. It was used by the monks of the Fuke School of Zen Buddhism in the practice of suizen (blowing meditation).